Armed police, helicopters and officers have been scouring parts of Alverstoke this afternoon. It comes after a robber threatened a woman in her 50s with a knife in Forton Road, Gosport at 12.54pm. Hampshire Constabulary was unable to comment on whether anything had been taken. 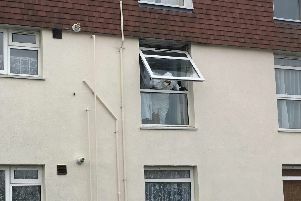 However, a spokesman said three men had been arrested in connection with the incident – a 20-year-old and an 18-year-old from Liverpool, and a 32-year-old whose address is not known. They also said: ‘We were called at 12.54pm to reports of a robbery incident in Forton Road, Gosport. ‘Officers are currently in the Alverstoke area of Gosport making enquiries. Hampshire Constabulary has now confirmed that three men have been arrested in connection with the robbery attempt. Police have been seen patrolling roads in Alverstoke, including Palmerston Way and Ashburton Road. A police helicopter has also been seen circling the area. Councillor Peter Edgar, who represents Leesland and Town on Hampshire County Council, said he had been contacted by a number of ‘worried’ residents. Cllr Edgar said: ‘It was quite exceptional to see quite a number of police arriving, plus the helicopter. It was quite a considerable turnout. ‘Quite a number of people in the area have been contacting me concerned about the police presence.